I was just reading the article that appeared in the NYTimes yesterday about Michel Rolland. I will assume if you are reading this blog that you have heard of him. You probably also know that he is the most famous wine consultant in the world with some 100 clients spread out around the globe. I did see 'Mondovino', the movie that portrayed him as a pompous blowhard who spends a total of 5 minutes with each of his winery clients, pronouncing "micro-oxygenation" as the answer to every problem. Knowing that cameras and editing can make anyone look obnoxious, however, I have tried to keep an open mind about Rolland. In the Times article, written by Eric Asimov, Rolland espouses that a wine's character comes from the grapes, a statement that is difficult to disagree with. 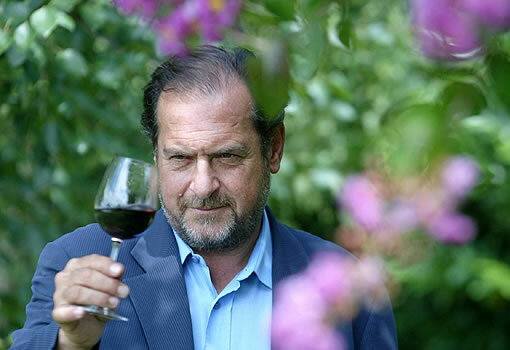 He denies that he, along with industry bigs such as Robert Parker and Wine Spectator, are homogenizing wine but will concede that he prefers (and if he does then everyone must) a bigger, riper, more "modern" style. Rolland is proud that he helps his clients make wines that can be drunk younger and crosses swords with Broadbent and other English critics in general by pointing out that they are used to drinking older wine like "old people always looking back to the old days." As much as Mr. Rolland says he is not trying to make wines that taste the same, it can be difficult to believe. There is that sense that wine is being stripped of its terroir and individuality to please modern palates. Are we getting that sense from the wine we drink, from the media? It's hard to say. As much as part of me wants to see Rolland as ‘Satan versus Savior’, I look at a partial list of his clients and can't help but be impressed: Chateau Angelus, Ornellaia, Araujo, and the list goes on and on. Moreover, winemakers I have a lot of respect for, such as Andy Erickson, can't say enough nice things about Rolland and his work. On the other hand, the wine monkey and I attended a tasting of Chateau Ausone recently and you could literally tell when Rolland's influence came to fruition in the wines. Notes on the Rolland vintages included more terms like "ripe fruit", "friendly", "rich" and so on. He changed the Ausone style, of that I am sure. He also talks a lot about ratings and making no "loser" wines. He seems indirectly to be referring to Corison as one of the "loser wines" that do not do well in the marketplace. That I simply cannot agree with. Cathy Corison's wine are beautiful and balanced, if not terribly fruit-forward, with a consistency that you only find from the best winemakers. As far as Corison not being successful in the marketplace I haven't seen the numbers but I have seen the wines on plenty of well-heeled wine lists around town. So, the jury is still out for me in regards to Mr. Rolland, making Asimov's question of "Satan or Savior" more of an ongoing query. I guess all we can do is monitor the wines over which he has an influence and see what becomes of it all down the road. All I can say is, he must be doing something right at the going rate of $30,000+ for about 4 visits a year. Sign me up!